Tales from a tribble: Is something wrong with this picture? At Brazil innauguration.....Hugo Chavez and Secretary of State Hillary Clinton were all smiles as they mingled with the presidents of Chile and Colombia and the prime minister of Portugal while waiting to meet Rousseff. 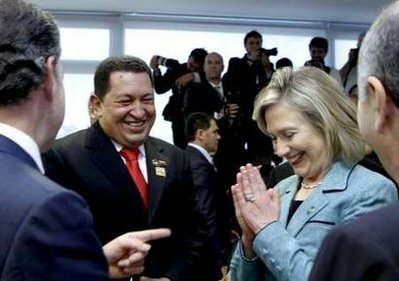 At one point, Chavez extended his hand to Clinton, who shook it, smiling. They chatted for a few minutes before moving on to formally greeting Rousseff. There were no reports on what was said between them. Chavez on Tuesday reaffirmed his decision to reject diplomat Larry Palmer as President Barack Obama's ambassador-designate to Caracas, and challenged Washington to break off diplomatic relations if it didn't like it. The State Department responded the following day by revoking the visa of Venezuelan Ambassador Bernardo Alvarez, who was in Venezuela on vacation. I don't know about you but this makes me uneasy to say the least...and rather sick to my stomach.